The Okanogan hosts high numbers of butterflies, birds, and mammals. More than 200 species of birds, from sage thrashers in the shrub-steppe to ptarmigans in the alpine areas, spend some part of their lives in the Okanogan. Waterways offer quality habitat for harlequin ducks, ospreys, and eagles. The Pasayten Wilderness, in the ecoregion’s northwestern corner, still retains its full complement of large herbivores, such as moose, mountain goats, and bighorn sheep. Its more carnivorous inhabitants include wolves, grizzly bears, and lynx. Small populations and a dwindling gene pool raise conservation concerns for these and other mammals. A broad range of amphibians and reptiles, among them western rattlesnakes, painted turtles, and Great Basin spade foot toads, can also be found in the Okanogan. Biologists have identified several priority habitat types in the Okanogan. Riparian areas and wetlands in the Okanogan play many vital ecological roles. They are habitat for tiger salamanders, Columbia spotted frogs, great blue herons, and sandhill cranes. Columbia River wildlife habitats have been inalterably changed by the Grand Coulee Dam, which blocked anadromous fish runs and inundated riparian zones. The Okanogan valley shrub-steppe is an important migration corridor for animals moving between the grassy interior of British Columbia and the sagebrush sea of the Great Basin. Ponderosa pine stands host arboreal biodiversity like Northern goshawks, white-headed woodpeckers, and Western gray squirrels. The tender buds and shoots of aspen forests provide important food source for songbirds, sharptail grouse, and deer. 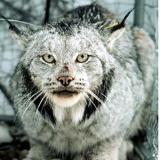 Regenerating lodgepole forests offer ideal habitat for snowshoe hares and, their chief predator, the lynx.